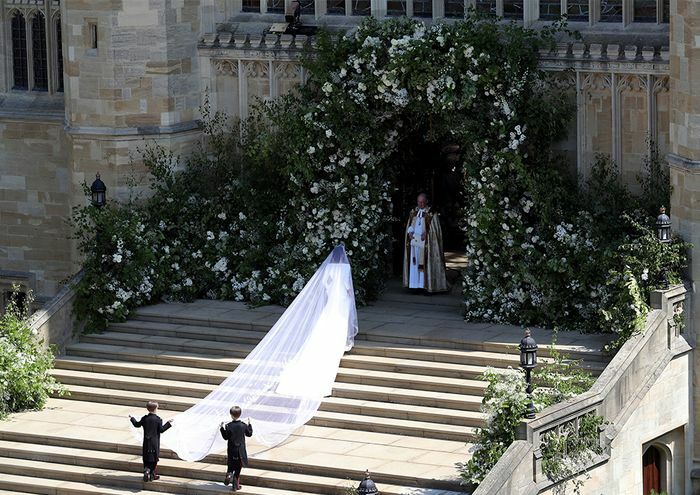 Meghan's veil featured the "distinctive flora of each Commonwealth country united in one spectacular floral composition." Meghan Markle's bridal curveball—to commission the super-talented British designer Clare Waight Keller to create her stunning wedding dress via the house of Givenchy and its haute couture department—puts the actress and now royal family member on a very iconic list. The ultra-luxe bateau-necked, double-bonded silk cady gown was a mighty feat of fashion engineering using only six meticulously placed seams, and will undoubtedly switch the continued trend for princess-style lace gowns (as made popular by Kate Middleton) to simpler, satin sheaths. Meghan Markle in her bespoke Givenchy Haute Couture dress designed by Clare Waight Keller. Meghan's pared-back lines made our minds instantly turn to an original Givenchy costume worn by Audrey Hepburn for a wedding scene in the legendary fashion film Funny Face. Hepburn's skirt was—as one would expect—fuller and far more suited to the 1957 release date of this seminal flick, but both of their top half designs feel distinctly Hubert de Givenchy all over: the fitted bodice, waist-nipping cut and the flattering slashed neck framing their equally delicate faces. 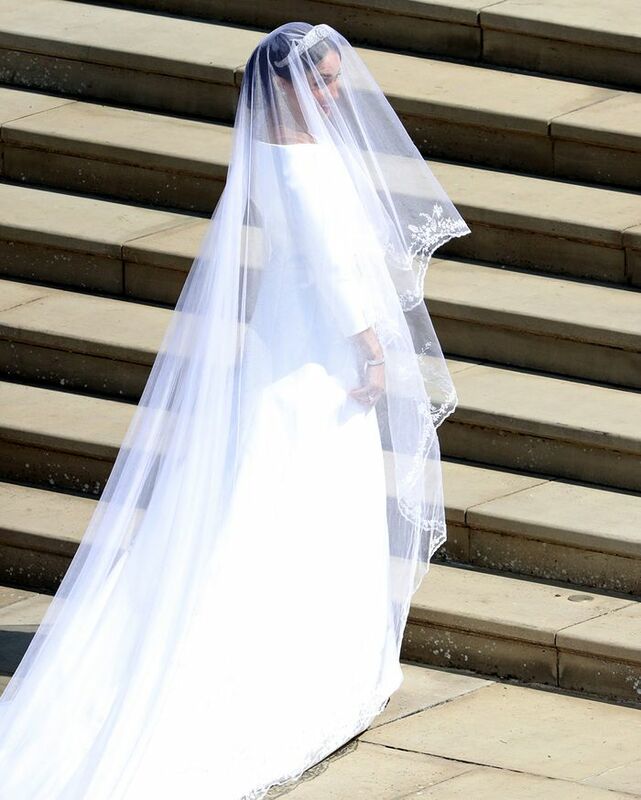 "Classic of Meghan's impeccable ability to balance modernity and classical style, Meghan's wedding dress is extremely reminiscent of the 1960s Givenchy bridal dress," Hamish Shepard of Bridebook tells us. A close-up on the bateau neckline and Cartier earrings. Audrey Hepburn in Funny Face, 1957, wearing a bridal dress from Hubert De Givenchy. Lara Stone wearing a Givenchy by Riccardo Tisci bridal gown in 2010. An archive shot of a model wearing a Givenchy wedding dress. Kim Kardashian in her form-fitting Givenchy wedding dress created by Riccardo Tisci. Hubert de Givenchy alongside a model wearing the finale bridal look in 1991. Christina Ricci in a Givenchy gown created by Riccardo Tisci. Carla Bruni modelling a bridal look in Givenchy's Haute Couture 1994 show. Audrey Hepburn at her own wedding to Andrea Dotti in 1969 wearing a cute pink creation from Givenchy. A beaded bridal look from Givenchy's A/W 79 collection. A caped wedding dress showcased during Givenchy's A/W Paris Fashion Week catwalk show in 1990. Now, see Meghan's dress from every angle.